The theme for this week's challenge is "Orbs." I Am the Diva has a lovely and inspiring tale to tell about why she chose this theme. 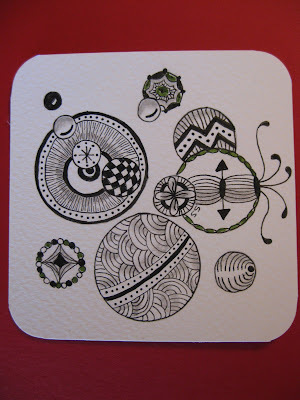 Here are a couple of photos of my "Orbs." Wonderful! I love them both - but the black orbs really jump out at me - love how you achieved the glossy look on these. 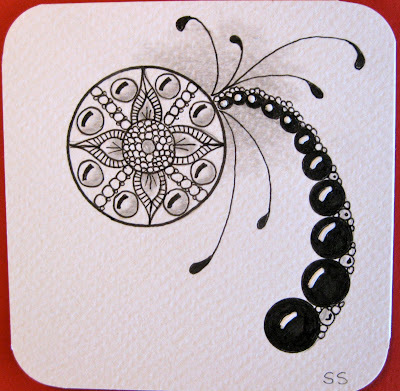 I'm infatuated with the top zentangle. Almost ridiculously appealing. Great job! both of them are great...well done! Love the sprouting effect of the 1st and the floatingness of the second. I LOVE the top one! Somehow reminds me of butterflies or dandelions. I quite like the first one with the black 'beads' and the 'sprouts'. that first one is so simple, i love it!! i just saw your orbs !they are wonderful! i love that strange plant a lot! these are wonderful Susan! I especially love the second one...it's like an enchanted science project! So glad you stopped by.....ENJOY!! Having always been a student of the art of living large, I look for the beauty in most people and situations, and am a keen observer of my surroundings. I love color, fresh food, music with a beat, and dancing. How nice of you to join the journey! Copyright © Susan Stewart 2010. All rights reserved. No part of this document including, but not limited to text, images, video or audio, may be reproduced without permission. Please respect my original ideas! !